It's Ronald Reagan's turn to get the Bill O'Reilly treatment. The Fox News host revealed on Tuesday that the next installment of his enormously successful book series on the deaths and assassination plots of historical figures will focus on the 40th president. 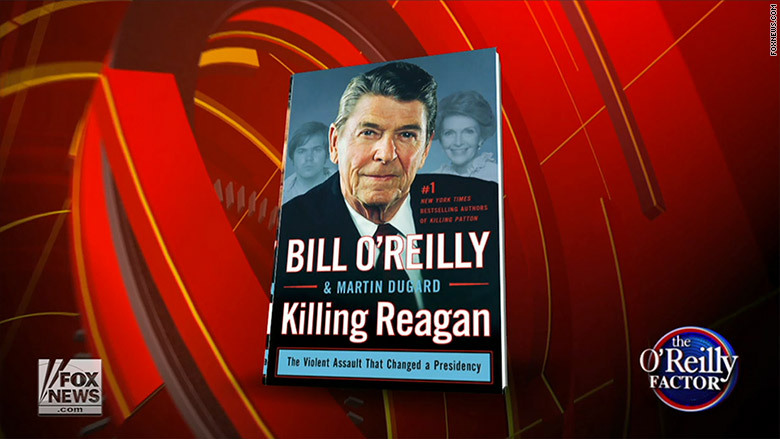 "Killing Reagan" will hit shelves on September 22. "Like all the others, this book will be somewhat controversial because we have uncovered brand new stuff, some of it surprising," O'Reilly said on his top-rated program. Those other titles include "Killing Lincoln" and "Killing Kennedy." Last year brought "Killing Patton," which focused on the mysterious death of the famed American general. O'Reilly's 2013 title, "Killing Jesus," was adapted into a movie that aired earlier this year on the National Geographic Channel. It was the third book in the series to be adapted into a film by National Geographic, following movie versions of "Killing Kennedy" and "Killing Lincoln." The movies have had some big names attached. Rob Lowe played the title role in "Killing Kennedy," while Tom Hanks served as narrator for the Lincoln movie. The films have also been commercially successful. The Palm Sunday debut of "Killing Jesus" drew the largest audience in National Geographic's history. The channel's CEO said last month that O'Reilly has visions of a theatrical release for "Killing Patton." But there would be no movies without the books, and those have been best sellers. O'Reilly touted on Tuesday that there are 12 million copies of the books currently in print. According to Nielsen BookScan US, the "Killing" series has sold 6.8 million books. One of the books, "Killing Kennedy," provoked controversy when evidence surfaced that appeared to contradict O'Reilly's assertion that he was at the scene when an associate of Lee Harvey Oswald committed suicide. The publisher, Henry Holt and Company, dismissed the challenge and said "we fully stand behind Bill O'Reilly."